Photo by Evelyn Landow. Courtesy of Laura Nelson. The Passage Theatre Company’s co-founder and artistic director Cory Hardin said he wanted to create a home for artists — a place where they can create in a safe and respectful space. In the aftermath of the Profiles Theatre scandal in 2016, in which it was revealed that the violence shown on-stage at Profiles Theatre was real and actors were being abused both on and off stage, Hardin said it was important not to put theater at the expense of people. More than that, however, Hardin said he wanted to form a community. Founded on these principles, The Passage Theatre Company is now putting on its inaugural production, “Spirits to Enforce,” from Nov. 1 to Nov. 17 at the Berry United Methodist Church in Chicago. 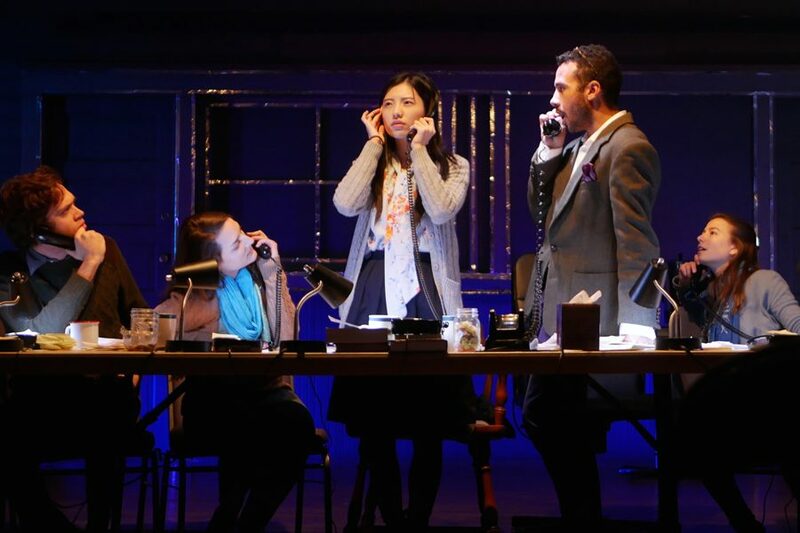 The play features the work of multiple Northwestern students, faculty and alumni. The show focuses on a group of superheros telefundraising for a production of “The Tempest.” The cast — a group of 12 — is nearly on-stage at all times, and each actor plays different roles in each section of the show. Preston Choi (Communication ’18) plays the role of Wayne Simon, also known as “The Untangler.” Choi said this show mirrors the foundations of The Passage Theatre itself, which makes it a topical first choice. Choi became involved with The Passage Theatre through his connection to the show’s director, Will Quam. Quam was a faculty assistant of the Theatre Arts Division of Northwestern’s National High School Institute program, popularly known as Cherubs, while Choi was a student, he said. The two kept in contact, and Quam reached out to Choi when auditions came around for “Spirits to Enforce.” Hardin also cited the Cherubs program as the reason there are so many NU alumni involved in the show. Julianne Lang (Communication ’18), who plays Diana Blake in the show, also met Quam through the Cherubs program. She said the transition from the Northwestern theater community to the larger Chicago one has been quite smooth, especially because both are so tight-knit and talented. Lang said another reason Hardin co-founded The Passage Theatre was because he wanted to form his own opportunities for the theater he wanted to create. Another principle was to respect artists — one that actors and crew, he said, were drawn to.